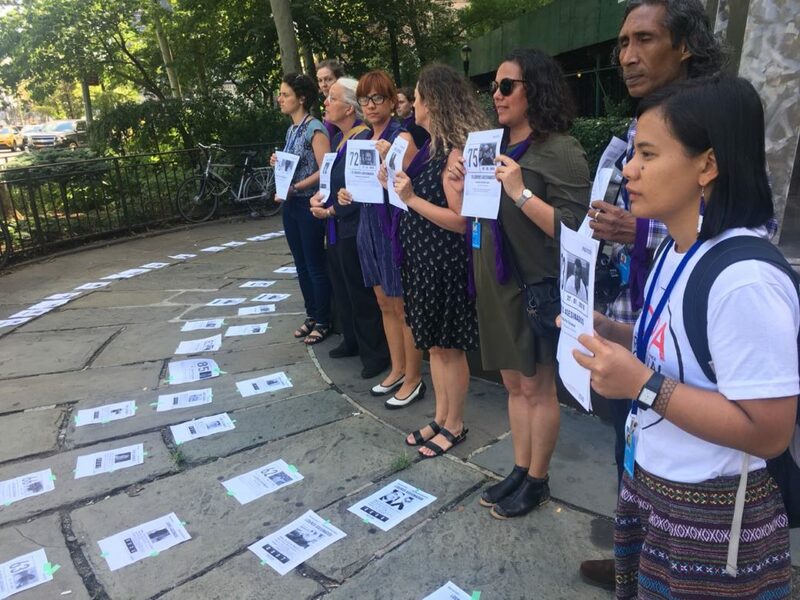 New York, 19 July: Activists from various organizations worldwide  protested against the murders of at least 313 human rights defenders in front of the United Nations headquarters two days after the Colombian government reported at the High Level Political Forum (HLPF) in New York . During the last two days of the event dated from 16-18 July, at least four new murders took place in Colombia, which the Colombian government blatantly ignored, said the activists. The High Level Political Forum (HLPF) is deliberating on the Agenda 2030, which is the inter-governmental plan of action to achieve global sustainable development by 2030 through a set of 17 Sustainable Development Goals (SDGs) set by the United Nations to tackle issues like poverty, hunger, climate change among others . At this event, Colombia presented on Monday its Voluntary National Report (VNR) on the national implementation of Agenda 2030 but did not mention anything about the escalating violence in the country. Countries like Norway, Denmark and Singapore raised questions about civil society engagement and the worrying situation in Colombia. The recent phase of the violence against social leaders, environmental and human rights defenders has escalated since the signing of the Peace Agreement in 2016. Eradicating poverty and leaving no one behind is at the heart of Agenda 2030 (PNUD) , “but in Colombia hundreds of people are being left behind through violent murder taking place under the governments nose. Social and community leaders are being targeted.” said Diego Cardona of CENSAT. The recently murdered four activists are Ibes Trujillo, afro-descendant leader from the northern Cauca ; Juan de Jesús Moreno Palacio, afro-descendant teacher killed in the school he worked at in Curillo – Caquetá ; Luis Eduardo Dagua, leader of the vereda el Carmelo whose body was found with clear signs of torture; and Roberto Jaraba, leader from trade union ‘sintramineros’. The activists condemned the Colombian government and agreed with the group of countries involved in the “The Subgroup on Human Rights of International Cooperation in Colombia”  , chaired by Canada and the Netherlands, who rejected the murders, threats, harassment and stigmatization against human rights defenders in Colombia. He reported threats against him for 3 years ago which is why he had been relocated from Cartagena del Chaira, the same province where there are 40 teachers threatened.